Commercial diving (diving for pay) is divided into two main types, surface-oriented diving and saturation diving. In surface-orientated diving, divers in helmets work underwater, connected to a breathing apparatus on shore or on board a ship, barge, or platform. Typically divers work in pairs, one underwater and one at the surface tending the hoses and equipment. Surface-oriented divers can work safely at depths up to 300 ft (91.5 m), but divers can only spend a limited amount of time underwater. The effects of water pressure can lead to decompression sickness. Under pressure, nitrogen collects in the diver's body tissue, blocking the arteries and veins. If the diver rises too quickly, the nitrogen forms bubbles in the tissue, something like the way a soda bottle bubbles when uncapped. Gas bubbles in the tissue cause pain, paralysis, or death. After a deep dive, the diver needs to decompress gradually, returning very slowly to the surface pressure in order to avoid decompression sickness. Decompression time is related to the depth of the dive and the duration. With a deep dive of only one hour, decompression time can take days. Surface-oriented diving is only practical for small jobs. The second type of commercial diving, saturation diving, is more useful for large-scale construction projects. In saturation diving, divers use a pressurized chamber, sometimes known as a Deep Diving System (DDS), attached to a diving bell. The chamber and bell begin on board a ship. A team of divers boards the chamber, which is then mechanically pressurized to simulate the environment at the depth of the planned dive. The chamber is a complete living environment—equipped with beds, shower, and furniture—and able accommodate a team of divers for weeks. When the divers are acclimated, they exit the chamber through a mating tunnel and enter the diving bell, which is also pressurized. A crane lifts the bell off the ship and drops it to the underwater site. Once at the site, one diver exits the bell in a diving suit and helmet and begins working. The other diver remains in the bell and tends the first diver's hoses and equipment. After an interval of perhaps two hours, they switch. Working from a bell, the divers may put in an eight-hour day underwater. Then they are ferried to the surface in the bell, enter the pressure chamber, and switch with the next shift of divers. When the entire job is completed, the team decompresses in the pressure chamber. Though they have submerged multiple times the team only needs to decompress once. Others duplicated Halley's achievement, but the design was not significantly improved until 1788. 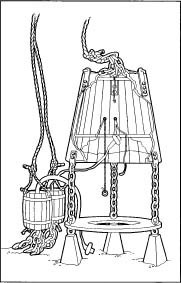 In that year, a Scottish engineer, John Smeaton, made a diving bell that used a pump on its roof to force fresh air inside. Smeaton's bell was used by divers doing underwater bridge repair. A variety of diving equipment was invented in the nineteenth century, leading to workable diving helmets connected by hoses to an air supply on the surface. This equipment tended to be heavy and bulky, made with hundreds of pounds of metal to withstand deep water pressure. Workers on tunnels and bridges went down in huge cast iron bells or elevator-like chambers called caissons. As little was known about the hazards of pressure, many of these workers sickened and died of what was called caisson sickness, now know to be decompression sickness. Saturation diving was made possible by the work of Dr. George Bond, director of the United States Navy Submarine Medical Center in the mid 1950s. His experiments showed that a diver's tissue became saturated with nitrogen after a certain time of exposure. After the saturation point was reached, the duration of the dive was unimportant. A diver could remain under pressure for weeks or months. The time needed for decompression would be the same, whether the diver stayed at the saturation point for an hour or a week. Bond's experiments led to the development of Deep Diving Systems. These were used frequently by workers in the oil industry in the 1970s and 1980s, when deep offshore oil drilling platforms flourished. Two important modern diving bells were the bathysphere and the bathyscaph. These were deep sea diving vessels made for scientific observation. The bathysphere was built by William Beebe, an American zoologist, and engineer Otis Barton in 1930. Beebe, fascinated with underwater life, conceived of the diving machine, and Barton was able to design it. Barton's idea was to make the chamber perfectly round to evenly distribute the water pressure. It was manufactured from cast steel a little over 1 in (2.5 cm) thick and 4.75 ft (1.5 m) in diameter. The bathysphere weighed an enormous 5,400 lb (2,449 kg), almost too heavy for the available crane to lift. Beebe and Barton made multiple dives off Bermuda in the bathysphere, reaching a depth of 3,000 ft (900 m) in 1932. Due to the great strength of the sphere the divers were protected from pressure, but the bathysphere proved unwieldy and potentially risky. It was abandoned in 1934. Diving bells are custom-built according to customer specifications. The customer approaches the manufacturer with an outline of what is needed. Depending the needs, the outline will specify bell shape, minimum number of occupants, number of windows, and any other special needs, such as racks to hold equipment. The manufacturer looks over the customer's plan, and then draws up a final design. 4 After the sections are welded together, the bell is inspected. It may undergo various tests, from visual inspection of the welds to ultrasonic scans. After these tests comes the "proof test." The bell is filled with water and pressurized for one hour at one and a half times the pressure it was built to withstand. In other words, if the bell was designed to withstand the pressure found at a depth of 600 ft (183 m), 282 psi, the manufacturer subjects it to pressures found at 900 ft (274.3 m), or 415 psi. 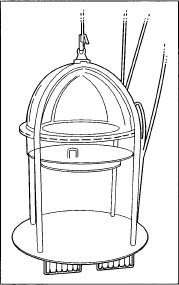 The bell should easily be able to withstand the proof test. It has been designed to withstand a pressure of four times its general use pressure, as a safety precaution. 8 The manufacturer delivers the bell as a "raw' vessel. The customer then outfits it with all the needed machinery such as tracking devices, cameras, and radio transmitters. Beebe, William. Half Mile Down. New York: Dull, Sloan and Pearce, 1951. Parker, Torrance R. 20,000 Jobs Under the Sea: A History of Diving and Underwater Engineering. Palos Verdes Peninsula, CA: Sub-Sea Archives, 1997. Piccard, Jacques, and Robert S. Dietz. Seven Miles Down: The Story of the Bathyscaph Trieste. New York: G. P. Putnam's Sons, 1961. Bachrach, Arthur J. "The History of the Diving Bell." Historical Diving Times (Spring 1998). Diving Heritage Page. June 2001. < http://www.divingheritage.com >.